Expeditión África Athletes develop their creative side for charity! 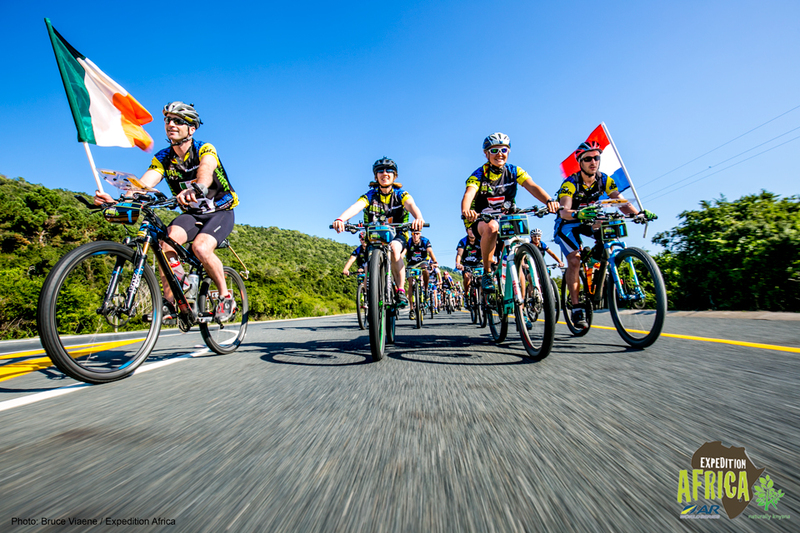 Over 200 Expedition Africa athletes cycled along South Africa’s National Road; The N2 towards the Sedgefield Mosaic & Outdoor Market, waving their countries flags with pride. 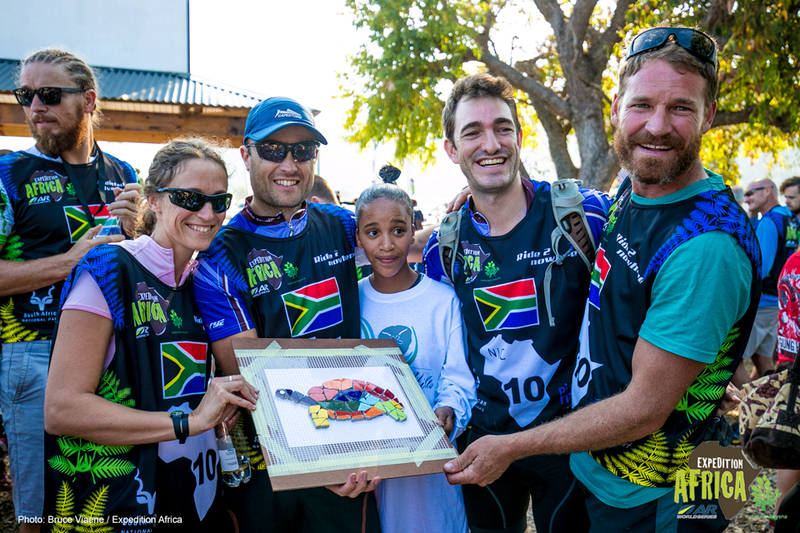 Each team taking part in this year’s gruelling 544km Adventure Race was paired with children from the Masithandane Bursary Fun for Children to create a unique element of a Mosaic Masterpiece that will live in the market for years and years to come. The Knynsa Lourie, Seahorse and local fynbos including the respective teams country flags were mosaic’d in the market earlier this afternoon. Each team’s name and sponsor of the mosaic’d piece will be featured in the ‘masterpiece’ at the Sedgefield Mosaic & Outdoor Market in appreciation for their support. Funds raised from this community project will go towards the Masithandane Bursary Fund for Children. This registered local NPO has been working in the Sedgefield area for 10 years, where the fund is utilized to assist families in need with transport costs to school, school fees and uniforms. The majority of the Greater Sedgefield Area’s population is located in formal and informal settlements away from infrastructure, services and employment opportunities. “The Bursary fund is a preventive measure needed to prevent high school drop-outs, teenage pregnancy, crime, drug abuse and the dangers associated with hitch-hiking” shares Weaver. “Today was such a lovely day, teams were able to create something beautiful for a worthy cause, and we are so appreciative of Chris Elion for hosting our massive group this afternoon” shares co-race organiser; Heidi Muller. 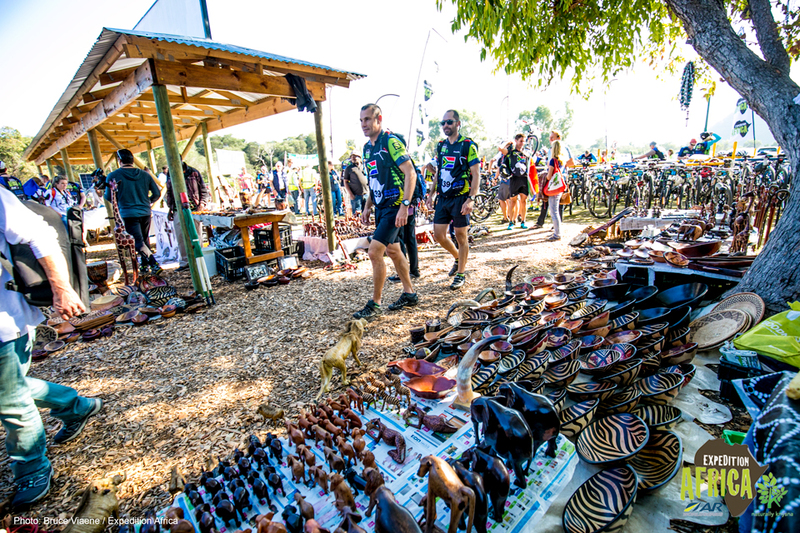 The market was buzzing this afternoon as teams enjoyed the ‘giving back’ element of this race. “It was fun to step out of race mode and appreciate where you are, the people and the community, especially when this where we will be racing for the next 6 days” shares Australian athlete, Samantha Gash from DASH x RSS Expedition Africa after this afternoons community project experience. According to Greg Vogt of Knysna & Partners, the organisation is encouraged that the event includes the Garden Route as a whole. “This experience was awesome! It was lekker to leave something behind in a place where we will be for the next couple of days” excitedly expresses Jesse Ternent of the duo Team Atlas. Although the project was a great success, organisers Heidi and Stephan Muller would like to invite supports (local and abroad), members of the public and family members to support the initiative by donating to the Masithandane Bursary Fund before Friday, 20 May 2016. All those who financially contribute towards the cause before this date will have their names incorporated into the Mosaic’d Masterpiece in appreciation. ← Expeditión África ….. Otra vez marcando un camino.